Mormon Mommy Writers and Friends: What is Your Element? Did you find something in life that brought you true joy and happiness, but had to leave it behind because it was not considered a good career choice? 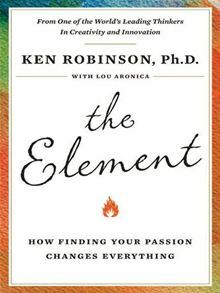 I read a wonderful book this past month called "The Element- How Finding Your Passion Changes Everything" by Ken Robinson. In it, Dr. Robinson talks about the idea that we all have an Element, the part of us "where the things we love to do and the things we are good at come together." For some of us this Element could be math, business management, or philosophy, while for others it is dance, music, art, or teaching. Robinson truly believes that those who excel in their field are not special people with amazing gifts, they are simply people who have found their Element and pursued it. This book has opened my eyes to the way that I want to raise my children. I have new ideas about how to help my children find their passions and use their skill and abilities to help them in the areas of their life where they may not be as strong. In the beginning of the book, Robinson gives an example of a young girl. At 8 years old, she is struggling in school, she has a hard time completing assignments, sitting still, and paying attention. The teachers believe she has a learning disorder and want to send her to a special school. The girl's mother takes her to a psychologist to be evaluated. The young girl sits on the couch and patiently waits for 20 minutes while the psychologist speaks with her mother. She is scared. She doesn't think there is anything wrong with her and she knows what it means to go to a special school and knows that this man is important in deciding her fate. After speaking with her mother, the psychologist thanks her for waiting patiently and says she needs to wait a little whle longer while he speaks with her mother out in the hall. He then guides her mother out of the room, but on his way out he turns on the radio. After the door closes, the Dr. and the girl's mother peak through the window in the door. The moment the door shuts, the girl gets up and begins to dance. The psychologist tells the mother, "You know, Mrs. Lynne, Gillian isn't sick. She's a dancer. Take her to a dance school." This young girl was Gillian Lynne who later became a world famous choreographer, helping to create (among many other things) musical theater productions including Cats and The Phantom of the Opera. We have made a goal as mothers to do everything we can to help our children reach their full potential, both here on this earth and spiritually. I love this. I will definitely have to read the book. Sometimes I look at the way education systems work and have to wonder if there is a better way. Why are we trying to force every child into the same mold. I am sure through the process we lose a lot of "geniuses" who didn't fit the mold. I could rant on about the issue but in truth I just wanted to say thanks for the post. I saw this author interviewed a couple years ago, and I thought he was great. Such a brilliant approach to nurturing the best in us.